FitnessSyncer: We’ve been working out! We have just released a fury of features, new integrations, and apps to help you track, analyze, and stay motivated on your health and fitness journey. The power of FitnessSyncer is the ability to combine all your data, no matter the source, into one powerful system. Use your favorite apps, trackers, and devices for each activity. FitnessSyncer unifies the steps, distance, duration, calories burned, weight, blood pressure, glucose and blood oxygen levels, nutrition, oxygen, and sleep data — all in one place. And without further ado, here’s what’s new! Integrate with Samsung Health and Apple Health! We received many requests to integrate with Samsung Health and Apple Health — and we’re proud to announce that it is now available! 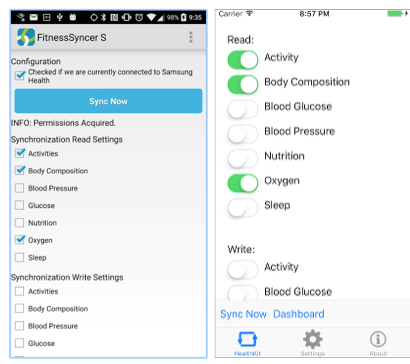 Integration with Samsung Health and Apple Health requires the installation of a free App on your phone which allows FitnessSyncer to read and update your Samsung Health and Apple HealthKit data. Once installed, select the categories of data you wish to display on FitnessSyncer — or synchronize by selecting Synchronize. To synchronize automatically, enable Auto-Sync in the App. For Samsung Health, select Preferences and enable Auto-Sync. For HealthKit, accept Notifications, or enable and update the Auto-Sync properties under the Settings tab. These Apps only expose the Samsung Health and HealthKit datasets. The full experience of FitnessSyncer is still on our mobile-friendly website. 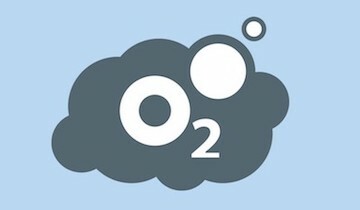 Tracking your blood oxygen levels? So do we! And of course, CSV from Amazon S3, DropBox, Google Drive, OneDrive or E-mail. 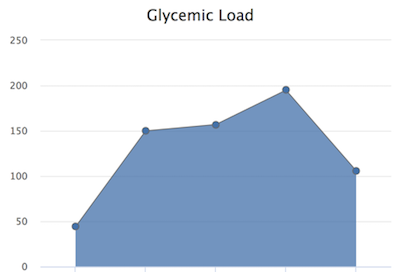 If you’re tracking Nutrition using our Notebook, CSV files from one our cloud providers, or E-mail, you can now chart your Glycemic Load in our Stream or Dashboard. If you’re a FitnessSyncer Pro user, you can now enter your Basal Metabolic Rate (BMR) in your Profile. Then, add a chart to your Dashboard to compare your Basal Metabolic Rate against your activity, caloric, and nutritional intake. 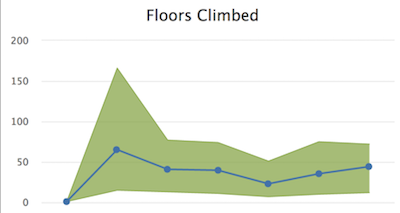 If you’re tracking how many flights of stairs you climb or your device automatically does this for you, you can now visualize that data on the FitnessSyncer Dashboard or receive E-mails to keep you motivated! Use PWX files in addition to GPX, TCX, FIT, KML, KMZ and CSV which we already support. FitnessSyncer now allows you to see your data instantaneously for the services below! As soon as you track it, we’re notified, and pull the data into our system. For FitnessSyncer Pro users only, we’ve kicked this feature up a notch by automatically synchronizing your activity instantaneously to other services. Note, you can disable Auto-Sync in the Profile tab on your Account. TrainingPeaks is revamping their API and as of December 7, 2016 FitnessSyncer will temporarily be unable to sync activities with TrainingPeaks. We anticipate the ability to upload files to TrainingPeaks will return early 2017. However, TrainingPeaks will no longer support downloading workouts after December 7, 2016. We are happy to announce that we’re collaborating with TrainingPeaks. Seamlessly synchronize your health metrics such as body composition, blood pressure, sleep, and SpO2 data from FitnessSyncer to TrainingPeaks to enhance your training and analysis. Good news, this feature is available now! Tis the season for indulging — followed by yet another health and fitness New Year resolution. There’s no better time for a FitnessSyncer Pro subscription — save 25% until January 7th, 2017. FitnessSyncer Pro makes a great gift for marathon runners, triathletes, cyclists, or anyone wanting to connect multiple services and devices. Simply e-mail us at support@fitnesssyncer.com to arrange an account for a gift recipient. FitnessSyncer Pro provides all of the following and more! Synchronize your data when it’s most convenient for you, even every hour, instead of some time overnight. Includes our new Auto-Sync feature! SAVE 25% on your first annual subscription until January 7, 2017 — Now Only $29.99 per year! We have many exciting features planned. Stay up-to-date by following us on Twitter or Facebook.